If you keep up to date with the latest interior trends, you might have noticed that wallpaper has made a real comeback. Gone are the days of over-the-top patterns, plastered from floor to ceiling and hung with glue that sticks like concrete. Today’s wallpaper is different. It’s easier to apply and remove, can be customised to a space, and comes in such a variety of patterns, colours and textures that designers and homeowners are spoilt for choice. Here we’ve applied a simple grey striped pattern that has added depth and texture to the room and unified the colour pallet. The application of a great design to a feature wall can add a real pop of excitement to a room and provide a good bang for your buck if you are looking to update a tired space. Designers are specifying small doses of wallpaper to tie in with an overall design concept. Updating a space is made easy too, because the wallpapers of today are removable with the right tools. Experienced installers use steam machines to remove paper when a change is needed, or for those that find long term commitment challenging! 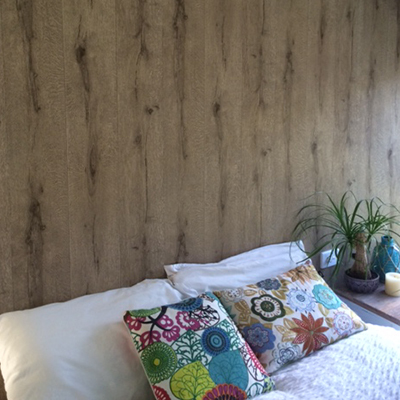 This beautifully textured wallpaper to a bedroom added real warmth to our client’s bedroom space. We sourced it from www.nattyandpolly.com.au and it’s called Black Forest – Light Brown by Rasch. The key to getting the right look for your project is to choose a paper that unifies the space, rather than overwhelming it with pattern and colour. Think about texture, not just print. Grass cloth and wood-grain paper and flocked designs are increasingly popular as they add visual interest, depth and warmth without overpowering a room. Of course sometimes a pattern that screams ‘wow’ is just what a room needs. Playful spaces such as kids’ bedrooms can be transformed with fun prints; think dinosaurs, princesses, animals and rockets! For a feature wall designed as a focal point, the range of bold patterns to choose from is endless. Accent colours like deep navy in hemp paper or a print like the popular Cole and Son ‘Woods’ shown below work perfectly. Unique walls can be created by uploading your favourite shot from a holiday, a picture of your family or even a special pet. Companies like rebelwalls.com.au offer this service and have a range of great murals that can be printed to the wall dimensions you supply. Wallpaper offers you the opportunity to think outside the square and truly make your space unique! Think New York, a map of your dream destination, a field of flowers or a sky full of clouds. The options are really only limited by your imagination. 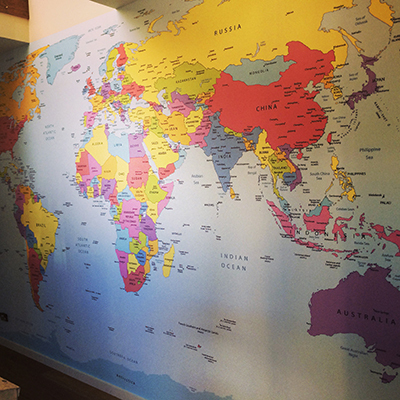 We installed this map that the client had custom printed to fit their wall. 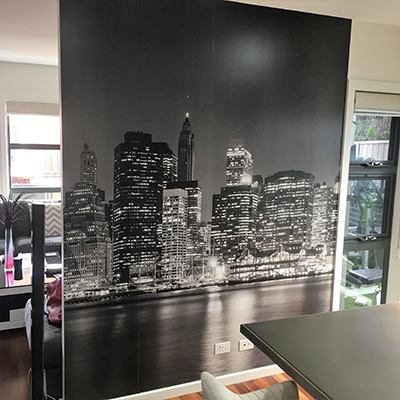 We installed this shot of New York that the client had custom printed to fit their wall. You’ve chosen the paper – now what? 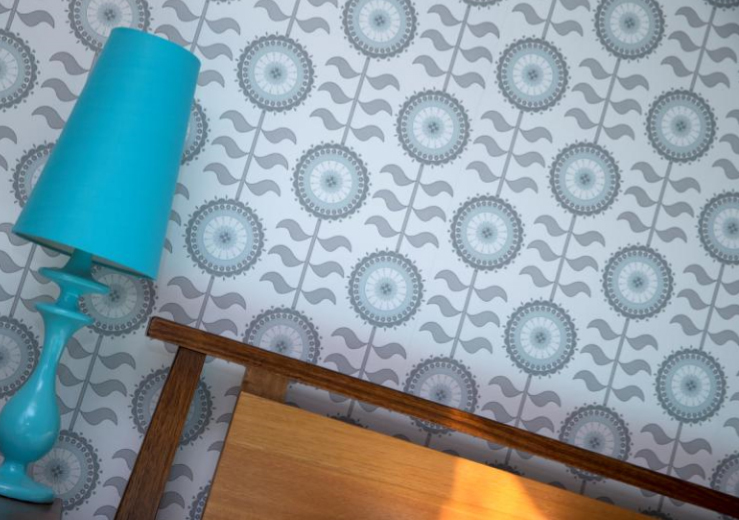 If you’ve spent hours trawling online through the world of wallpaper and still can’t decide, consult a professional! Interior designers are trained to translate your ideas into a vision and will be able to choose the right paper and even the wall that should be papered. We always recommend Nadine from Journeyhome.com.au to help our clients with their interior design projects. And please choose a professional installer. Wallpaper can be expensive and you want the job done properly. Pattern matching is tricky and bubbles or lines in the joins can ruin the overall appearance. 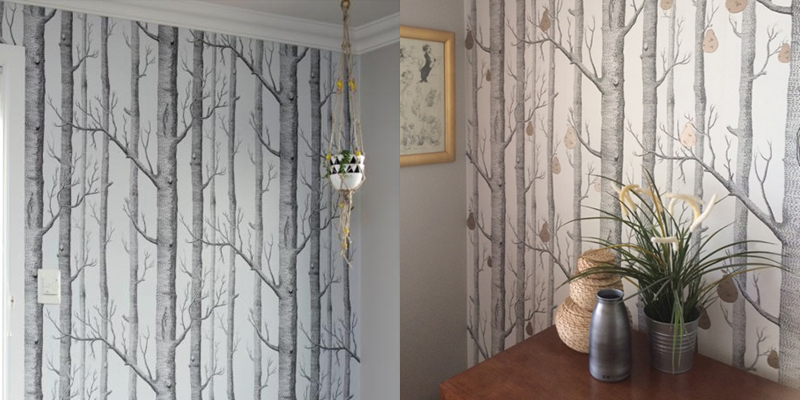 The process should be fun, so if you are looking for an experienced wallpaper installer in the Canberra area, call or email us and we’d be happy to meet with you.